will find the best coverage available, based on your usage, and pay for you. What is Insure My Car? A concept to disrupt the auto insurance sector in the same way Uber changed the taxi business and AirBnB changed the hotel industry. The data corresponding to the usage period is made accessible and immutable by writing it to the IOTA tangle. The insurance payments are automatically taken care of by the car as well using the IOTA currency. Additional factors can be worked into the system, including time of day, location, traffic conditions, local speed limits, weather, whether the vehicle is self-driving, and more. The Insure My Car system can be used for a variety of other applications as well, beyond insurance. For example, automatic payments for the usage of city infrastructure or toll roads, ride sharing, product delivery, etc. To demonstrate the ease of extensibility of Insure My Car, we recently integrated it with a third-party platform called High Mobility, which makes a fleet of virtual vehicles and trip simulators available. We created a virtual Porsche, a virtual trip in front of the White House, and hooked Insure My Car up to the High Mobility to extract all the real-time usage data as the trip was being simulated. Our virtual vehicle triggered dynamic switching of insurance policies and even paid for insurance for its virtual trip! The integration was featured in a webinar hosted by the IOTA Foundation, accompanied by Kevin Valdek (CTO @ High Mobility) and Terry Shane (Founder @ bIOTAsphere). One of the bIOTAsphere developers that led the Insure My Car project from a technical perspective took some time to discuss the technical details behind Insure My Car. From the tech stack used to some of the most challenging technical challenges experienced while creating the Proof of Concept. If you’re interested in the in-depth details behind Insure My Car, take a few minutes to watch Mike Boht answer some community questions asked by Jessa Molyneux. Learn more about the technical details and challenges behind Insure My Car. Why did you describe this event as Putting the “Proof” back in to Proof of Concept? I think there’s a big disconnect for many people who are not totally immersed in DLT technologies. They understand that Distributed Ledgers are a disruptive technology, but still have trouble seeing how it will impact their lives in the near term. It’s all a bit too theoretical and far away. Many POC projects use “toy” cars or “toy” trains to illustrate general principles and still fail to create that “Aha” moment where end-users suddenly see the connection and understand that what’s coming isn’t ten or twenty years away. We wanted to demonstrate just how real the technology could be by proving how these tools could impact our lives in the next few years. To make the point, we used a two-year-old production vehicle with no add-ons, hacks, or modifications to show how we could turn an existing business model on its head. 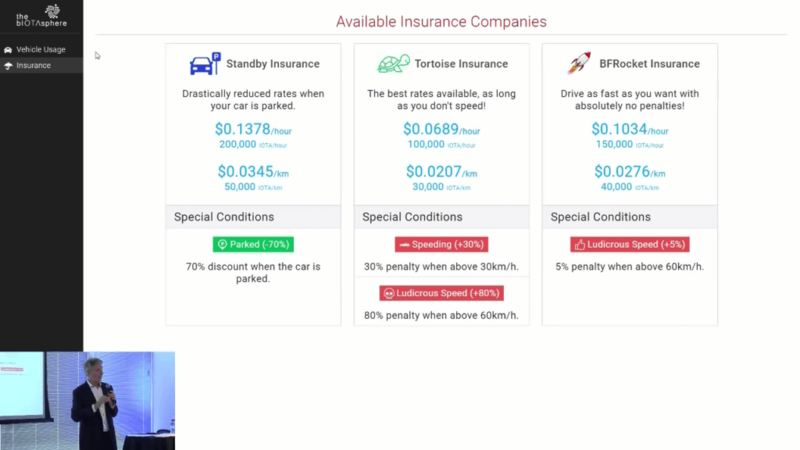 Automotive insurance is a ubiquitous product, in an industry that is ripe for disruption and this was a great opportunity to show how new technology could potentially disrupt the space in the next 24-36 months. We’ve seen the taxi and hotel industries caught flat-footed by new models; insurance is the next low-hanging fruit. The demo was intended to be a bit of a wake-up call to the industry but mostly an invitation to forward thinking players to collaborate with us. So why do you think that car insurance represents such a good opportunity? Many people resent how much they spend on auto insurance because they feel that they are good drivers with a great track record and that somehow, they are subsidizing all of the “bad” drivers out there. The problem is made worse because automobile insurance is not a discretionary purchase – it’s a mandatory requirement if you want to drive a car. While many consumers think that insurance companies make huge profits, the reality is quite different. Automobile Insurance is typically highly regulated and premiums are often subject to government or regulatory approval that limits the profit margins of each company. But from the consumer perspective, since most of us don’t make claims, the entire system just feels “unfair” on a gut level. Competition is fierce and the industry is based on old actuarial models that use historical data that by today’s standards, lags the real-time nature of available data. Just look at tools like Waze that can reroute your journey based on an accident that happened two or three minutes earlier. Connected vehicles, that produce large amounts of data in real time, together with other sources of information from mapping services that know what sort of road you are driving on, prior accident history in your current location (so-called “black-spots”), weather conditions, speed limits, hazards, congestion, and so on, provide an opportunity for disruption that many insurance companies are already looking at. Unfortunately, the approaches that have been used to date are fraught with challenges. In exchange for installing an app or a piece of equipment that lets the insurance company monitor your driving, policy holders are being offered discounts, or non-monetary rewards for “good driving”. These systems have a distinctly “Big Brother is Watching You” feel to them and typically only have a behavior modifying effect for the first month or so, before people forget about them and go back to their normal habits. Many consumers feel that the loss of privacy isn’t worth what they get back in return and the systems are easily fooled intentionally or by accident – a phone app that isn’t disabled can mistakenly track you in a different car, or even on a bus or a plane, when you’re not even the driver. Why is your approach different to what’s being done already? As we move towards a future of smarter-cars, connected, semi-autonomous and fully autonomous vehicles, the rise of the new “sharing economy”, to which we can add new technologies like the IOTA Distributed Ledger capable of feeless micro-transactions, we have opportunities to fundamentally rethink the old ways of doing things and auto insurance is a perfect example. What if we could think of the car as being its own economic agent capable of choosing between a variety of competing offers for its business, based on a variety of data elements that couldn’t be faked, hacked or changed after the event? What if the vehicle could pay for the Insurance as a Service (IaaS) on an hour-by-hour, minute-by-minute, or even on a meter-by-meter basis, instead of the old models where we insure the primary driver and once you’ve chosen the insurance company, you’re locked in for the year? These were the questions we wanted to explore but above all, in our POC model, it’s the car that is buying insurance and not the owner or the driver (though they may ultimately be funding the car’s wallet). We require no driver information at any time nor do we store information related to the driver so this system is totally respectful of privacy. For the POC, there was no cloud database as all information required to support the coverage was stored in an encrypted format on the IOTA Tangle. This also means that the data would be in a common cross-industry format, and not locked up in a proprietary database, controlled and siloed by a car manufacturer or an insurance company. Please understand though that auto insurance is a complicated industry and we really want to engage with the experts in this field to build a solution that works for everyone. That means automakers, insurers, policy makers, and regulators. Why did you choose a Tesla for the Insure My Car POC? I drive a Tesla Model X and as one of the early connected-cars, I’ve studied how it is constantly sending a significant amount of data back to the manufacturer as a data stream. 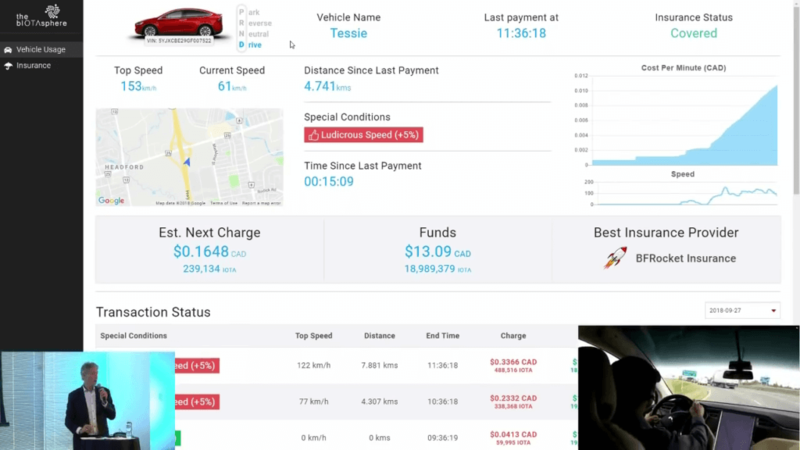 Much of this data is available through a public API that is documented and accessible with the appropriate authentication, without needing to get Tesla’s permission. This allowed us to simulate the new business model without needing to enroll a car company or to hack or modify the vehicle in any way. Ultimately all vehicles on the road today are legally required to have an on-board diagnostics port that we could have tapped into for some of this data, and we could have added a GPS tracker and a SIM card for communications but we wanted to illustrate what’s possible with an unmodified production car. Of course, not everyone is driving a Tesla but all new cars will be sending this data in the very near future if they are not doing it already. The introduction of 5G cellular technology is going to transform the automotive landscape even further. The Tesla lets us prove what’s possible in a way that grabbed attention, but we’re more interested in the generalized and abstracted use-case. So what’s different about the concept behind the Insure My Car POC? In our model the car has a wallet, funded with IOTA that can be used to buy insurance. Multiple insurance offers are available to the vehicle and each has a set of conditions and modifiers that apply to the offer. We limited the number of offers to just three for the POC but in practice the number of offers could be very large. Think of an eBay or Kijiji model connecting buyers and sellers of insurance. Our three offers were given descriptive names and included Standby Insurance (intended for vehicles that remained in Park for the entire interval), Turtle Insurance (for vehicles that traveled slowly), and BFRocket Insurance (for those who drive fast or aggressively). Each offer could also have so-called modifiers that would add surcharges or provide discounts based on additional parameters – a bit like surge-pricing on Uber. So, exceeding the speed-limit while on the Turtle plan, might increase your rate progressively based on just how much you were exceeding it, but other factors could be included like time of day, weather conditions, road conditions, etc. Just to be clear, we assumed for our POC purpose, that the car always has some “default” coverage and that the owner is funding the vehicle’s wallet sufficiently to pay for this default coverage. Just like gas, if your tank runs dry the car won’t go! We also assumed that any driver who was at the wheel for the POC was there with the permission of the owner and that they were licensed to drive and not under the influence of drugs or alcohol – not that different from the current model. A new insurance period could start every minute, every hour, or a some other agreed upon interval but we imagine a world in which there’s a market of dozens or hundreds of offers and the vehicle is constantly selecting the best deal from what’s available. No consumer could ever do this, nor would they want to, since the car is choosing and paying in real time. The solution is especially attractive because it works under the current model of car ownership, but also functions in fleet, car-sharing, ride-sharing and other models too. The vehicle wallet can be funded by the owner, by payments made by passengers or by machine-to-machine transactions as the car performs autonomous services in the future. These future revenue streams might include payments from cargo items, or payments for services such as selling power stored in the car’s battery to a building or another vehicle. Why would Insurance Companies want to adopt this model? Insurance is an interesting business in that it’s operated and regulated in different ways in different markets. In many cases, vehicle insurance is seen as a matter of public policy. The space is highly competitive, the margins are often regulated, and for the most part the product is commoditized. Consumers are always looking for a better deal but cannot stay on top of the myriad offers and we’re all left thinking that we somehow missed the best deal. All of the “Switch and Save” advertising in the space plays on this fear. Any company that can be first to offer this sort of product would capture a great deal of market share and initially all of the competing real-time offers would originate from that one provider. But, just as Uber was followed by Lyft, there would be others who would join the space later but the cost of being late to this party could be enormous. On the flip-side, there is a huge potential for cost savings in this model. A significant portion of your premium today goes to paying for sales and marketing expenses, as well as for the commissions for the intermediaries who typically sell the policies. Additionally, the profitability of a policy premium that insures a parked car could allow first movers in the space to have an unbeatable offer that would leave their competitors scrambling to catch up. Similarly, the profitability of niche offers (such as our fictitious BFRocket offer which charges a high premium for aggressive driving) would allow for hyper-competitive rates for the more reasonable driving periods. How does regulation fit in to all of this? It’s an excellent question. Governments are both enablers of the old model and the potential obstruction to a new reality that they don’t yet understand how to deal with. There are powerful interest groups and lobby groups who are happy with the status quo, and they are likely to fight any changes tooth and nail, but governments are ultimately going to be faced with issues driven by this new technology too. Most road infrastructure today is funded by taxes on gasoline, diesel, and other fuels but those taxes will vanish as more and more vehicles migrate to electric power. How will they make up for that lost revenue? Ultimately, the smart vehicle is going to pay for usage of the infrastructure on a time and distance basis, and the same wallet that is buying insurance, could also be used to pay for the road infrastructure, directly to each of the various jurisdictions in which it was traveling. Pay more for travel on highways than side streets, or based on time of day, or based on road congestion. This is another reason why car manufacturers and insurance companies need to get on-board or at least start experimenting with the technology. There’s lots of money at stake if you represent the conduit that can collect taxes on behalf of the government and do so in a way that is immutable, transparent, and beyond reproach. How do you see this concept being expanded? A POC by it’s very nature is kept simple to prove a general principle, but once you have a wallet and the logic that allows a vehicle to make payments, the extensions are mind-boggling. For starters you can add more and more “modifiers” to the basic model to account for environmental factors (weather, time of day, congestion, potholes on the road, nearby accidents, etc. ), vehicle behavior (speed, harsh acceleration/braking, enabled safety features on the car, etc.) and information that the driver is willing to share. In the POC, we don’t know or care who is driving the car beyond the assumption that the person at the wheel is there with the permission of the owner, but if you add a biometric scanner in the car (we’re already using Fujitsu Palm Vein Scanners in our other projects) you could modify the insurance based on what the driver chooses to share without in any way breaching their privacy. Additionally, you could expand on other things that the car might pay for – charging, parking, car washes, taxes, tolls, use of HOV or Premium Travel lanes. We’d like to really use this opportunity to engage with the various stakeholders to start a new conversation and to create new possibilities. We don’t have all the answers but we do know how to ask great questions! What sort of reaction have you had since revealing the InsureMyCar POC? We’ve been very pleasantly surprised. There have been over 7,500 views of the POC and we’ve received inquiries from around the world. 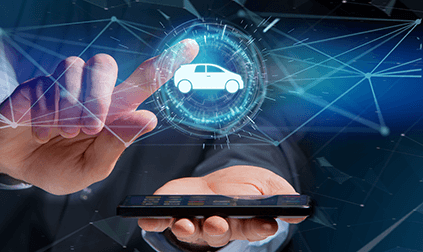 These have come from car companies, insurance companies, cellular companies (since most of the vehicle data is ultimately going to use cellular communications), finance companies and policy-makers. I can’t say much more than that; it’s still very early in what will be a long process but the people we’ve spoken to are intrigued with the fundamentally different approach we’ve taken and are interested in exploring the ideas further. What other projects are you working on at the bIOTAsphere? Anything you can share? We have several other projects that we’re very excited about in the fields of Smart Energy, Document Management, Recycling, Identity and more but we cannot share details as we’re under NDA. However expect to hear more cool stuff from the bIOTAsphere as we get engaged in upcoming community projects and continue to contribute to the vibrant, global IOTA ecosystem. For now, let’s just say that public announcements often come much later than all the hard work that has to go on behind the scenes, laying the foundations upon which you can build. I’d rather deliver something real than focus on hype, which typically only leads to disappointment, since reality rarely lives up to our “sweet imagination”.